When did you first start CrossFit? I started January 7, 2017 in the beginner’s class. I played baseball until college and have zero background in fitness. How did you first get intoCrossFit? How did it go? Before my current occupation, I was a lineman for American Electric Power. This was a very physical job that filled the bucket for movement and strength. After a day of work, the last thing I would have wanted to do was to open the door of a gym. After 13 years of linework, I moved to a supervisory role. This entails talking a lot and pointing my finger. The opposite of movement and strength. I made it 6 months and realized something was going to have to change. 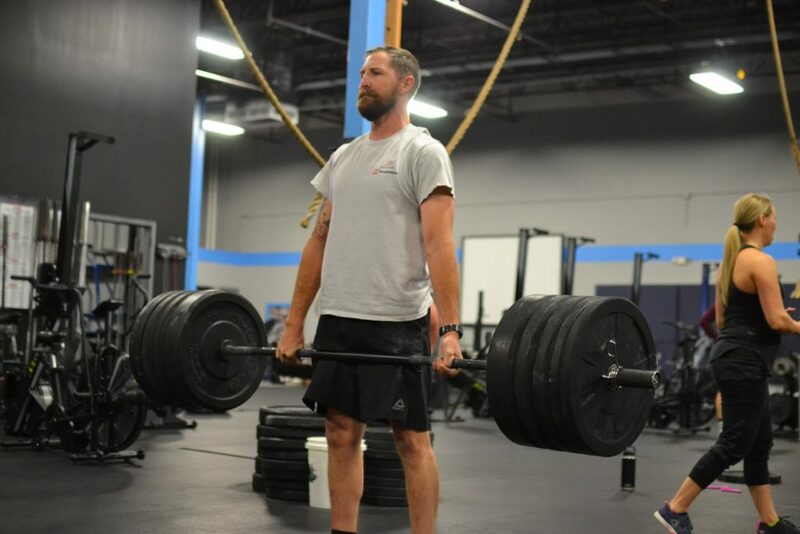 Because of my wife’s involvement with fitness at a “typical” gym, I knew that was not for me. I knew nothing about fitness, so I needed coaching. I needed accountability, which meant a team or community. Crossfit kind of checked all the boxes. Plus, it is described as a cult with a mascot called Pukie the Clown. Coming from linework, I’m kind of crazy. Where do I sign up? So, I did a quick google search and Crossfit Eclipse came up. I judged the website. Seemed legit. The next day I walked in the front door and told Aaron I needed somewhere to work out. So, I was enrolled in the beginner’s class. That class lived up to my expectations. I received instruction, I felt accountability, I wanted to puke, and I drank the Crossfit Kool-Aid. It has been very rewarding and shocking what one year at Crossfit Eclipse has done. In the first six months, I went from 23% body fat to 13% body fat. I hadn’t run at all for a decade and then 8 months later I ran in the Guinness Challenge and finished 87 out of a 1000 people in a time of 31 minutes (8 minutes off leader, but no one is counting). Because of the demand, it has made me clean everything up. I started drinking less, eating better, and sleeping better. I wasn’t about to let bad habits ruin all the effort that I put into it. It has been a domino effect for me. The more I do it, the more I want to do it. The largest impact is my stress level has gone down. Every day after work, I focus on getting ready for the WOD, performing the WOD, and recovering from the WOD. Because of that, I can’t think of work, kids, schedules, and other responsibilities. It clears and resets everything. Crossfit seems unique to me. Like me, a person can come into a gym, have zero background in fitness, and not know a soul. You will be welcomed with a smile, educated, motivated, and at times celebrated. You will wonder why you did not start sooner. Dad Stuff…It’s difficult and time consuming. My two boys sitting in car seats in the grass, all buckled- up with nothing but diapers on, pointing laughing AT me, while eating snacks.